Green Gate Access Systems has announced the opening of an office in Salisbury. The operation will be headed up by new employee Dan Small who has recently been appointed as Area Installation Manager, with more than seven years’ experience in the industry. In 2014, Green Gate Access Systems received more than 120 leads from around the Salisbury area and it is anticipated that an office in this location will fulfil an obvious requirement for their services. In addition to Dan, the company has also welcomed Freddie Woolgar who joins the team as Installation Assistant and apprentice Jimmy Wright who has joined under the government apprentice scheme. 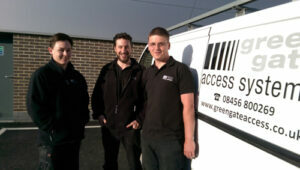 Jimmy is the third apprentice to be taken on by Green Gate Access Systems.